Often you'll notice the presence of fescue in your lawn because of its clump-like and tough texture that's difficult to mow down. Common in pastures, where it's less noticeable, fescue looks like a wide-bladed grass. Most homeowners prefer to rid their lawn of this grass that looks unsightly against the backdrop of a bluegrass lawn. A few different chemicals, used as active ingredients in herbicides, seem to work most effectively against fescue. Glyphosate, a chemical contained in popular herbicides such as Roundup, is applied to fescue clumps in the spring before it starts to turn green. Spraying fescue after it and the surrounding grass turns green will likely kill the surrounding grass if it comes in contact with the chemical. Wait for the fescue to die before digging out the clump. Reseed or resod the area with new grass after removal. TFC, or tall fescue control, is a restricted-use herbicide usually only available to lawn service businesses. Also known as Corsair or chlorsulfuron, TFC works best when used in the fall. It's slow-acting, but does kill only the fescue and does not harm most surrounding grass. Contact a lawn service company for application. 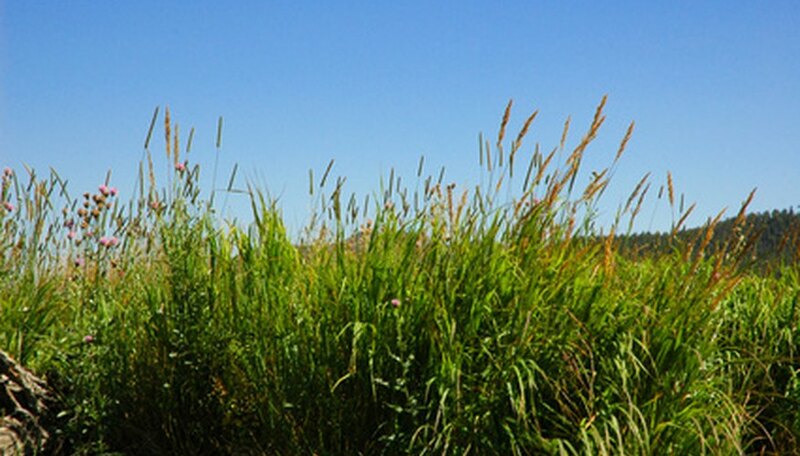 Imidazoline is the active ingredient in some commercial herbicides such as Plateau. It may be applied in combination with glyphosate or applied on its own. Imidazoline is a slower acting herbicide, but has more residual control than other herbicides and lasts from 6 to 8 weeks. Most wildflowers are killed if they come in contact with this chemical, so apply it sparingly around wildflowers or protect the flowers from overspray.